Following on from my previous tutorials on Google Sheets and WordPress Rest API some people have asked me if you can do the same with WooCommerce. Indeed you can. 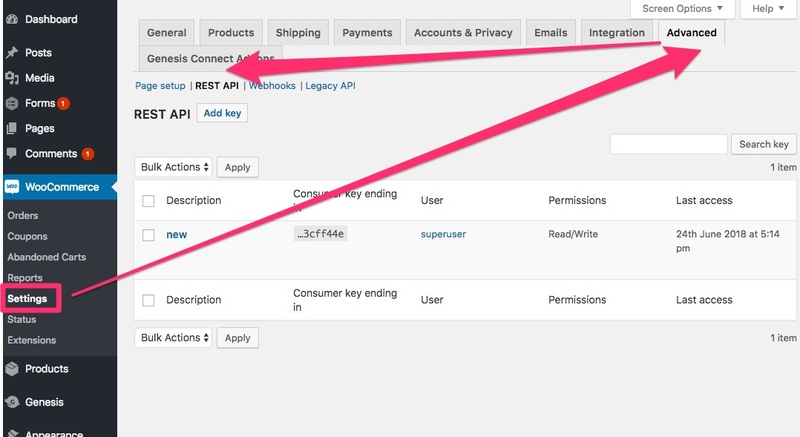 WooCommerce has REST API that provides access to any data you need. You can find the technical documents here. One of the main differences is that WooCommerce comes with an authentication method ( so you don’t need to add a method like you did here ). Lets assume you are familiar with Google Sheets and Google Scripts ( if not go back to the first tutorial and at least do the basics of getting posts ). And if you are reading this, we will assume you have a working copy of WooCommerce with some data in it ( ideally a test system to play with ) if so we a re set to get going. Most useful data from WooCommerce is likely to be private, e.g. Orders or updating Product prices, so whilst the other tutorials started with getting public data and moved on to private data, lets dive straight in ( another reason to at least have covered the basics here ). Login to and go to WooCommerce settings > advanced > api and create a key, with read/write permission and save a copy as you will need this for the script. Save this script giving it a name you can remember and makes sense e.g. Woo Orders. In the script editor, go to File>New>HTML file and create a file named credentials.html with your html form code as followsSave your script. Go back to your spreadsheets and refresh. Under add-ons you should now have a new menu e.g. Woo Orders where you can input the credentials you set up above. Getting the Orders into the spreadsheet. This function also kicks of the main function getting the orders. The getOrders function has to get the orders in chunks ( or pages as we should call them ) as there are limits on the number of orders that can be return in one go, this is to protect your server mainly. The function first check to see if we have stored credentials. Then loops through at 50 orders per page. Then finally outputs the buffer built up. The main API call is made in the next function. The authorisation is using basic auth – but sometime there are issues if JWT token are also in use or the server has a problem, so an alternative is query string for key & secret, see the commented out API line. It retrieves the data and pushes it into a structure. HereI have a double loop so i can output multi line items. // altenative to basic auth in case that doesn't work nicely e.g. you have JWT token plugin too. The other function, not covered yet is setupSheet all it is doing is clearing teh sheet and adding titles.